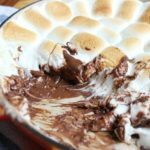 Delicious s’mores dip, made at home! Using fluffy marshmallows, Hershey’s chocolate and graham crackers, this baked oven appetizer dip is perfect for family! Spray the round pan with spray butter. Add a layer of Hershey’s Milk Chocolate bars. Place a layer of marshmallows. Bake in the preheated oven for 4 – 5 minutes or until the marshmallows are toasted.